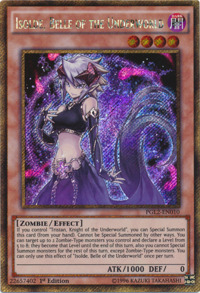 If you control "Tristan, Knight of the Underworld", you can Special Summon this card (from your hand). Cannot be Special Summoned by other ways. 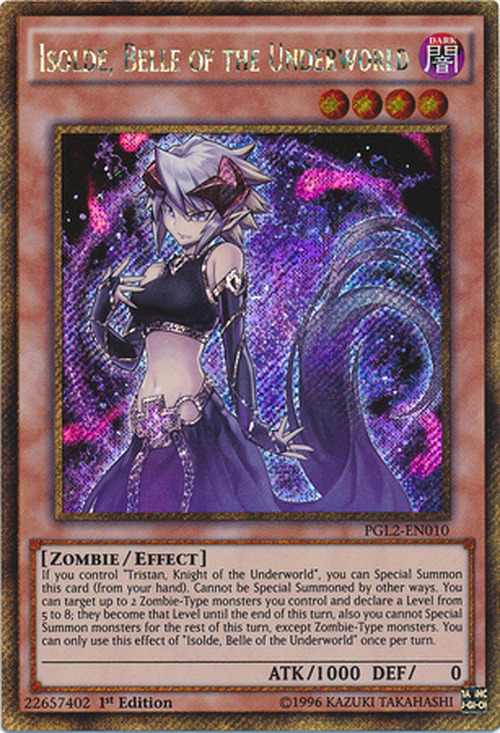 You can target up to 2 Zombie-Type monsters you control and declare a Level from 5 to 8; they become that Level until the end of this turn, also you cannot Special Summon monsters for the rest of this turn, except Zombie-Type monsters. You can only use this effect of "Isolde, Belle of the Underworld" once per turn. This monster is based on the character Iseult of the Celtic legend of Tristan and Iseult, which is cited as an influence on the romance between Lancelot and Guinevere. This is further supported by this monster and Tristan, Knight of the Underworld being ideal Xyz Material for Number 23: Lancelot, Dark Knight of the Underworld. This monster's Japanese name probably contains a pun: the Kanji 麗(beauty) is pronounced ri, the same as the Kanji 貍(fox). This would explain her fox-like design: she has long, sharp ears, her necklace and armbands have fox's head designs, and the end of her dress looks like a fox's tail.